Doudou Mapwanga Kitanda Dijke, better known as Doudou Ngumbu, defends the WBFed lightheavy title against Nadjib Mohammedi June 15 in Les Pennes Mirabeau, France. Ngumbu, 29-3, won the title in Poland outscoring the favored Aleksy Kuziemski and have both won and lost on the road fighting in Poland, South Africa, Germany and Russia and is a quality fighter a bit below the best at 175. Mohammedi, 27-3, came in as a late sub and took Nathan Cleverly the distance in a fight for the WBO interim title and have also been stopped by Thierry Karl and Dmitry Sukhotsky. It´s an interesting matchup for a minor title even though WBFed is working hard to grow bigger and is currently the most active in Europe of the many smaller organisations. 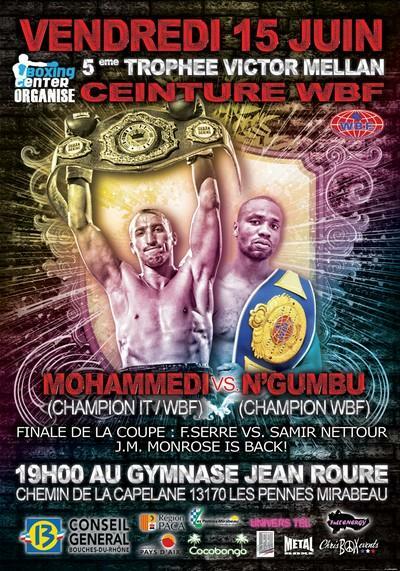 On the undercard former EBU cruiser champ Jean Marc Monrose tries another comeback. Monrose was very brave in losing the title against Marco Huck in 2008 but lost twice to Steve Herelius in 2009 and to Zinedine Benmakhof in 2010.